The eight remanded Eastern University Engineering Faculty students were fined Rs. 4000,000 and ordered to pay Rs. 8,000 as state costs yesterday. They were released after a strict warning. 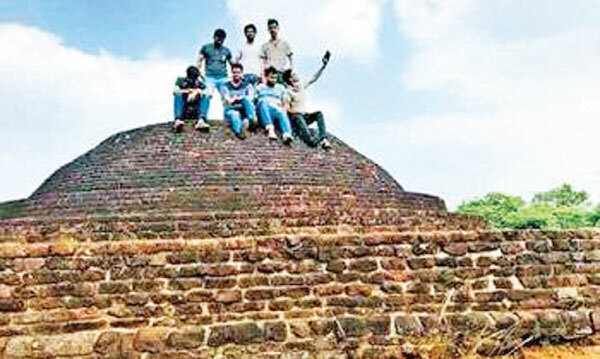 They were charged for posting photos taken on top of a dagoba at the Kiralgala Archaeological site on Facebook recently. They pleaded guilty to the charges made on three counts when they were produced before the Kebithigollewa district judge and magistrate Harshana de Alwis yesterday. The charges on the first count was proved while the eight students pleaded guilty to the charges on the other two counts. They were ordered to pay state costs of Rs.8000 at Rs.1,000 each and the fine of Rs. 400,000 at Rs.50,000 each.